Adobe has announced it’s shipping Creative Suite 4, which includes a major upgrade to Photoshop. There’s a page on Adobe’s site describing the benefits of Lightroom 2 and Photoshop CS4 together. 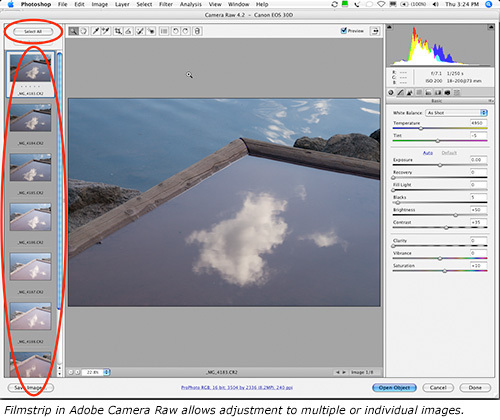 The Adobe Camera Raw (ACR) plug-in will run from within Photoshop and Bridge. To apply a saved preset or ACR default settings to multiple images, select all the desired raw image files in Bridge and then either double-click one of them or press CTRL+O (or the Command [Apple Key]+O on Mac). This opens all the selected files in Filmstrip mode in ACR. You will see all the chosen files in a vertical filmstrip running down the left side of the window. From here, you can choose to apply a preset to all or some of the images (use Select All, Shift Select, Control Select etc.). You can then continue to fine-tune settings for individual images. When you’re done adjusting settings in ACR, use the Save Image…, Open or Done buttons to move them through the workflow. Using this method, you can batch process large numbers of images in ACR and save them, for example, as resized JPGs for web, DNG files with embedded metadata, whatever. Many people ask whether it’s better to use Bridge or Lightroom. I use both, for different purposes. 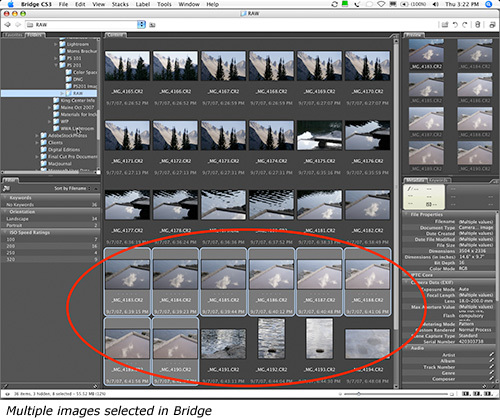 If I need to quickly find an image and I know its location, or I need to quickly look into a folder full of images, I will use Bridge. However, I use Lightroom for transfering raw captures to the computer, adding metadata, ranking, cropping, and processing (developing) the raw images. I go as far as possible within Lightroom before I take a file into Photoshop, usually only for sharpening, selective/localized editing such as dodging and burning, or soft-proofing prior to printing. 1. Lightroom is a standalone product and must be purchased separately; Bridge comes included with full versions of Photoshop. 2. Lightroom uses a powerful database to perform non-destructive editing (with unlimited undos) and provides for very fast searching within large numbers of images. Bridge is a file browser, meaning it can show you the contents of a folder and will preview files, but doesn’t keep track of the status or settings for any of the images. 3. Lightroom has a raw processing engine built-in, Bridge uses the Adobe Camera Raw (ACR) plug-in. However, the raw processors in current versions ofÂ Lightroom and Bridge/ACR are essentially identical. Personally, for the majority of reviewing and editing my photos, I generally prefer Lightroom for its streamlined workflow and its database capabilities. But for people who don’t wish to spend the money or take the time to learn a new program, Bridge with ACR is a totally competent solution. It can be overwhelming to begin sorting through a day’s shoot, which may contain thousands of image files. To make it easier, start ranking your images early in the workflow, beginning with 1 star for images that pass your basic requirements. Then filter your previews to only show 1-star images, and move on to assigning 2 stars, and so on. You will find that as you work your way toward 4 and 5 stars, you have much fewer images to deal with. This will dramatically cut your time selecting photos to be taken through final processing. In my workflow, images that make it to 4 stars will be processed for printing or web. 5 star images are those that have made it into my portfolios.